For many families, summer vacations are the highlight of their year. Hectic schedules are put aside for rest, relaxation, and quality family time. No matter where you go this summer, family memories will be made that will last a lifetime. A bad vacation memory is coming home to a burglarized home or vehicle. Since people are more active during the summer, our homes stand empty more frequently. In addition, many people take strolls or bike rides around the neighborhood and leave doors and windows open. Both scenarios make the home easy targets for burglars. Here are some tips to keep your home safe while you’re on vacation. 1. Buy a professionally-installed home monitoring system. Professionally-installed systems, such as ADT, offer many options for keeping your home safe. They provide this equipment for their customers. Security keypad – Central command for your home security system. Motion detector – They cover a large area of your home and can send you alerts and video clips if motion is detected while your system is armed. If you have, pets don’t worry. The sensitivity level can be adjusted based on the size of your pet. Entry detection – These sensors monitor your doors and windows. If a door or window is opened when your system is armed, you’ll receive a text alert. If you have small children, another nice feature is setting the door to chime every time they go in or out to play. I absolutely loved this feature when my kids were small. Glass break sensors – These sensors detect the sound of breaking glass. Don’t forget, ADT and others provide monitoring 24/7 and 365 days a year. Therefore, you may be eligible for an insurance discount. Talk to your independent insurance agent to learn more. Nest Guard – Alarm, keypad, motion sensor, and the brains in charge of the entire system. Nest Detect – A sensor that monitors doors, windows, and rooms. Nest Tag – The easiest way to arm and disarm the system without entering a passcode. Nest App – Keep tabs on your house from anywhere in the world. If someone breaks into your home, you’ll receive a text to call the police. If you want to add an extra layer of security, you can team up with Brinks Home Security. Brinks provides professional monitoring 24/7, 365 days a year. 3. Develop a plan with your neighbors. Let your neighbors know when you’ll be gone so they can keep an eye on your house. They may also be able to cut your grass or water your plants while you’re gone. 4. Light up the night. Install motion-activated outdoor lighting. If all the entry points to your home are illuminated, it’s likely they’ll move on to the next house. 5. Keep valuables and important documents locked. Don’t leave valuable jewelry or paperwork laying around. Store them in a fireproof lock box or safe. It may be wise to store important documents, such as wills, passports, and birth certificates, at a relative’s house. 6. Keep your house looking normal. When you leave home, make sure it looks like you still live there. Leave your blinds and curtains open. Install smart plugs to turn lights on and off on a schedule. The nice thing about smart plugs is you can change the schedule while you’re traveling. 7. Park in the garage. Cars parked in the driveway are not much safer than cars parked in the street. Car thefts can take place in less than 20 seconds. Always lock your belongings in your glovebox or trunk. It’s also wise to remove your garage door opener from the car. 8. Remove stashed keys. Storing spare keys under the doormat or rock isn’t the smartest thing to do. A lockbox or smart door lock is safer. 9. Halt mail and newspaper delivery. Newspapers and mail falling out of your box into the street is a telltale sign nobody’s home. Talk to the U.S. Postal Service about holding your mail while you’re gone. 10. Avoid social media. Don’t blast your travel plans on social sites before you go and during your trip. Post pictures when you return. Depending on your insurance policy, coverage may be provided. Coverages that may help if your home is burglarized are Dwelling Coverage and Personal Property Coverage. 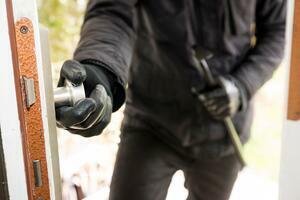 Dwelling Coverage provides protection by paying for repairs needed after a break in. Some examples include repairs for a broken window or door. Personal Property Coverage provides protection by repairing or replacing your stolen personal property. For example, if an intruder steals your large screen TV and gaming console, your insurance policy would pay for replacements of like kind and quality. If you have a home monitoring/detection system that sends you an alert when someone breaks into your home, you may be eligible for a discount on a West Bend Home and Highway® insurance policy. To learn more, contact your independent West Bend agent or find an agent near you by visiting www.thesilverlining.com.